The Week 21 action in the Corinthian League on Sunday saw a vastly reduced fixture list due to a combination of frozen or waterlogged surfaces owing to the recent spate of poor weather. 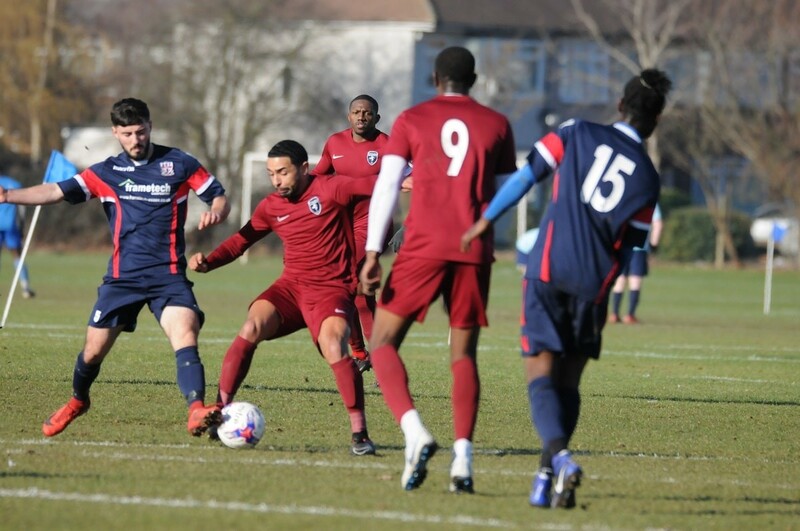 The day’s surviving Division Two Cup action did see some real entertainment as London Fire Brigade put in one their best performances of the season to take county cup semi finalists, Dagenham United, all the way to extra time. Fire goals from David Moore, Richard Kirby and Enrique Jiminez helped their side finish level at 3-3 at ninety minutes before succumbing in extra time. Sean Thomas continued his hot streak of form in front of goal with a hat-trick with Aaron Nuet’s effort completing an eventual 4-3 win for the Daggers. There was entertain aplenty in the Division Three Cup quarter final as Castle Green residents, Central Colts and Dagenham United Reserves, went head-to-head with both sides looking to book a place in the last four. The sides ended level at 2-2 in an enthralling ninety minutes. But Daggers hearts were broken in extra time with Colts netting twice to win it 4-2 to earn a semi final away at either Thames Ironworks Community or Roneo Colts. In Division One, Chingford Athletic maintained their chase of the league leaders by putting eight goals past Westferry Elite up in Waltham Abbey. Tom Pearce done the majority of the damage with a hat-trick alongside goals from Lee Bowers, James Clarke, Michael Johnson, Joseph Middleweek and Matthew Warwick confirming an 8-0 victory for Chingford. That result leaves them level with the leaders but from three more games played. The biggest movers of the weekend were St Augustines who moved up to third place in the table following a hugely important win at home against Wanstead Albion. In a closely fought match, David Fitzgerald and James Pararajan both got on the scoresheet for the Saints to render Emmanual Okunja’s goal as just a consolation in a 2-1 win. The division’s remaining game came not too far away in Hainault where Valiant were the hosts as they took on Ridgeway Rovers, the latter looking for a positive result to continue their quest for promotion to the top flight. Ben Cox got on the scoresheet for Valiant with Rovers managing to also score once to take a share of the spoils in a 1-1 draw. In Division Two, the game of the day came at Mayesbrook Park where hosts Barking were looking to close the gap on the leaders, taking on a side with equivalent promotion credentials in the shape of Royal Albert. In a close game, James Hobday and Michael O’Brien were both on target for the hosts with Albert also scoring twice to see the sides take a point each in a 2-2 draw. And the division’s other action came in Chadwell Heath where Ferns Seniors superb form sees no end with an emphatic 7-0 home win against Bretons Manor. Liam Coney made another big contribution with a hat-trick and Lathan Jordan scored twice to add to single goals from Chris Wilby and PJ Marcus. You would anticipate Ferns still having a very big say in the race for the top two. In Division Four, there was the first double header of the season involving two sides with plenty of match still to play as Monkhams made the trip to Dagenham to face Alliance United at The Leys. The first of those games ended in a 1-1 draw as a Matthew Acons goal for Monkhams was equalled but a Harry Smith strike for United. The second of the fixtures saw a different outcome to the contest with Monkhams running out comfortable 5-0 victors. Matthew Acons was again on target, netting a brace to go along with two goals from Charlie Thomas and a Cameron Perryer effort. It was a big day for one of our clubs in the quarter finals of the Essex Sunday Junior Cup as Barking & Dagenham Wanderers finally got to play Belfry after the postponement of the original tie last weekend. Wanderers led very early on and defended well until a Belfry free-kick on the hour levelled the contest. With the game seemingly heading for extra-time, Belfry broke Wanderers hearts, heading in from a corner in the last couple of minutes in a 2-1 scoreline. Belfry will now face another Corinthian side in the form of Dagenham United in the semi-final on 24th February. In the West Essex Sunday Charity Cup, there was an all Corinthian clash in the day’s hastily arranged quarter final tie as Brook Athletic looked to shock league leaders, Repton Park, in their tie in Loughton. But Repton’s league form has carried into this competition as they romped to a 6-2 win to progress on to a semi final against Valentine United next month.